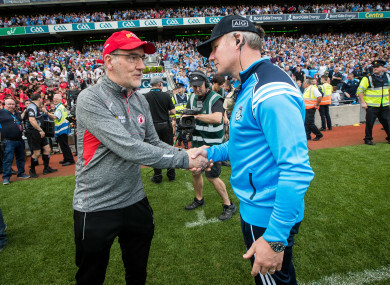 Tyrone manager Mickey Harte with Dublin boss Jim Gavin after last year's All-Ireland senior football semi-final. THE REIGN OF the Dubs will not last forever, Tyrone boss Mickey Harte stated at Monday night’s Ulster Championship launch in Strabane. With Diarmuid Connolly seemingly uninterested and Bernard Brogan on the long-term injury list, the Errigal Ciaran man believes there are chinks of light for the chasing pack. He also admitted that it is now a race against time to have All-Star Colm Cavanagh fit for the Ulster quarter-final against Monaghan on 20 May, struggling as he is with a quad injury. Email “'No team lasts forever' - Harte senses 'window of opportunity' to threaten Dubs' dominance”. Feedback on “'No team lasts forever' - Harte senses 'window of opportunity' to threaten Dubs' dominance”.